The reports keep coming in and being updated from corporate media sources seemingly distorting the facts relating to huge discrepancies emerging following their reports as stated here: Harbour death crash: [who stole the boat?] Quote: Clearly one cannot help reading the garbage coming from the mainscream media trying to cover-up for these people, why is that? Because they're the publicans responsibility or because Charlie Reynolds has influence? Or both? If these people were from Macquarie Fields they'd be in jail and refused bail and there is nothing more certain than that. THE lawyer for Matthew Reynolds, the man who skippered the runabout involved in an accident that claimed six lives in Sydney Harbour last week, maintains that the 31-year-old was in control of the boat even if he was not steering at the time. "I'm not suggesting he wasn't in command of the vessel [but] he wasn't driving at the time of the collision," Greg Walsh said. 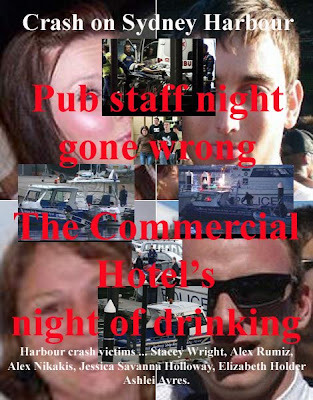 Cocktail barman Percy Small has been named as the man at the wheel of the runabout when it crashed into a larger fishing boat, killing six people? All thoroughly legal boat trip? Detectives investigating the crash will compare forensic evidence and witness statements after it was initially claimed Matthew Reynolds was at the helm? The two boats collided on Sydney Harbour a week ago about 2.40am (AEST) near Bradleys Head. Of the 14 people on the overloaded, 23-foot runabout, six died and eight were injured, including Mr Reynolds who remains in hospital in a satisfactory condition. It is believed those on board have also claimed that a third person may have been at the wheel during some point in the journey, News Limited reports? Witnesses have told police that after Mr Reynolds, a qualified skipper, negotiated the boat from Balmain Wharf he handed the controls over to Mr Small? Mr Small, who holds a boating licence and did not appear affected by alcohol, safely took the boat across the harbour to Watsons Bay. On their way back to Balmain, the boats collided, and it is believed both boats had their lights on at the time, News Limited reports. Both Mr Reynolds and Mr Small have yet to make formal statements to police. Sydney Ship Repair and Engineering, which owns the runabout, again said yesterday that Mr Reynolds had taken the boat without knowledge or authorisation. Alex Rumiz, 22; Stacey Wright, 21; Elizabeth "Lizzie" Holder, 20; Ashlei Ayres, 32, and Jessica Savanna Holloway, 25, were killed in the harbour collision. One of those rescued - Alex Nikakis, 29 - died later in hospital from severe brain injuries. A funeral will be held today for Ms Holder at 11.30am at the Camellia Chapel of Macquarie Park Crematorium, at North Ryde. Quote: It is not okay for the coporate media to direct the public opinion in this way. Or the police to lie for these people no matter who they are. It is not okay for police to bend the case to present us with clean-skins opposed to lawbreakers in a dirty world, not so much of corruption, but corporate and public mismanagement. Everyone should be treated equally according to the law and in the media. There is a lot of influence in the corporations here, specifically the publicans, the pubs around Balmain and tourist operator Charlie Reynolds. Most importantly for NSW, who is pulling these strings when it comes to the media? Who is pulling these strings when it comes to law and order and the police? What powerful body is capable of twisting the facts in criminal negligence cases? From my observation it appears to be 'News Limited' [Limited News] who have the affiliation with the NSW Police, not good for law abiding-citizens. Flowing on from that exposure then all the other corporate media just follow News Limited's [Limited News] lead. Then along comes the ABC if no one gerries over the discrepancies. Then the ABC make the same claim? Of course News Limited and CH Ten have deep affiliation with the police. That's why I call News Limited, Limited News, because their sources are government or police and they don't have to 'find stories' they get them for free!!! So who is directing traffic? NSW Police?? ?